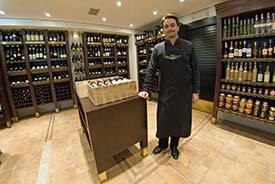 ABOVE: I Tre Mercanti is the place to go in Venice for top-of-the line foods and wines from artisanal producers. What are the main shopping areas of Venice? High-end designer shops are mostly in the San Marco district. Many are just west of the Piazza San Marco, on streets such as the Calle Vallaresso (which leads to the San Marco Giardinetti waterbus pier) or the Calle Larga XXII Marzo. You'll find most of the top Italian brands such as Frette, Bottega Veneta, Prada, Gucci, and Missoni here. The Mercerie are a series of shopping streets between the Piazza San Marco and the Rialto Bridge. Retailers range from upscale clothiers to mask shops, stationers that sell Florentine-style marbelized paper, food stores, Murano glass shops, and souvenir stores. Both sides of the Rialto Bridge (and even the bridge itself) are jammed with shops--many of them small--that sell Murano jewelry, mainstream brands of clothing, shoes, cellular phones, and other items for both tourists and locals. On the San Marco side of the Rialto Bridge, a short will walk will take you to Coin, Venice's only department store. Keep going, and you'll hit Strada Nova, a wide shopping street and tourist thoroughfare with a middle-class vibe. In Venice's quieter back streets, you'll find shops of every description, such as Il Pavone (peacock papers, journals, stamps, etc.) and one of our favorites, Annelie (embroidered nightgowns, little girls' dresses, purses, sachets, and more, all at surprisingly reasonable prices). Museum gift shops and bookstores are also worth visiting. (The shops at Ca' Rezzonico, the Peggy Guggenheim Collection, and the Fondazione Scientifica Querini Stampaglia come to mind.) Also check out the bookstore and gift shop at Venice's main tourist office, a.k.a. the Venice Pavilion, next to the Giardini ex-Reali near the San Marco Giardinetti vaporetto and airport-boat stop. One more general shopping tip: If you see something you want, buy it. Shop hours can be unpredictable, you may have trouble finding the store again, and somebody else may buy the item before you return to the shop. Is it safe to buy knock-offs from street vendors? Yes and no. The vendors or "vu compra" aren't dangerous, and as long as you understand that a 50-euro Louis Vuitton lookalike is more likely to be made by a Lu or Liu than by Louis, you're probably getting a decent deal. However, you could be fined by the police if you're caught buying counterfeit goods, although this doesn't happen very often. For more information, see our articles on Illegal Street Vendors and Fines for Fakes. The Rialto Food Markets (see above) are packed with stalls, and the neighboring streets have cheese shops, salumiere (delicatessens), and stores where you can buy prepared foods. Venice's traditional alimentari (small grocery stores) have mostly disappeared, but some still exist. Greengrocers and bakeries are scattered around the city, with some neighborhoods being better-served than others. See our Venice Travel FAQ: Food and Drink page for more information, or go to our Supermarkets article. Where can I load up on household items for an extended stay? The Ratti appliance, housewares, and hardware store is a good starting point. It also has a good selection of rubber boots for acqua alta season. If you don't mind a trip to the mainland, you can take a free bus to Panorama, a hypermarket in Marghera that sells groceries and a wide variety of other items. (It's the kind of place you might go to stock up on Parmigiano Reggiano, pasta, and toilet paper.) Panorama's suburban mall has other stores, too--most notably SME, which has appliances, electronics, and a large selection of products for babies and toddlers.